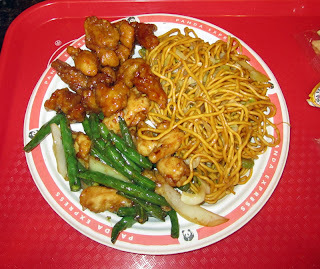 We had a fairly nice fast-food, pseudo-Chinese dinner at Panda Express on a recent Saturday Evening. It is what it is, decent food for a fair price. Certainly not authentic Chinese, certainly not gourmet, but decent. I've learned that the best time to visit is when they are busy--that is, if you want fresh food and a good selection. Late at night or during off times, the food sits for too long. But if you get there at a busy time you can have OK food. I had the Chicken and Beans and they were indeed fresh, and the Orange Chicken, which is good comfort food, a bit too sweet and bland, but comfort food nonetheless. The lo mein (noodles) I had were a bit undercooked, but a bit of soy and some mustard (not very hot) fixed that. All in all, an OK meal for inexpensive fast food. 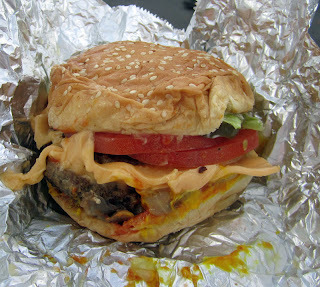 I've been dying to try Five Guys Burgers and Fries and finally got my chance recently. I liked it! 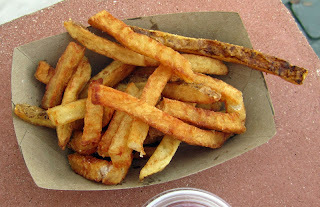 But first a word of warning: a regular order of fries will easily fill two people, if not three. Order a large fries at your own risk! I ordered the Cheeseburger "all the way." Well, as you can see in the picture, it was quite a lot to handle--almost too much to handle. First off, there were two delicious patties of beef and two slices of cheese. The patties were rather thin, proabably 1/8 to 1/10 pound apiece, and so cooked well done, but they were still plenty juicy and not overcooked--with a nice beefly flavor. "All the way" means it was topped with lettuce, tomato, mayo, grilled onions, grilled mushrooms, pickles,ketchup, and mustard--quite a lot to handle--and it was! It may look a bit rumpled in the picture, but that's because I ordered "to go" and walked about a half mile with it before I could partake. But it was yumm-yumm delicious. I think next time I'd order a single patty with cheese and just a few select toppings, this one was a bit much to eat, but oh, so satisfying. The fries deserve great mention too. These fries are better than McDonald's by a long way. Maybe close to the best fries I've ever had. And the portions are huge. They were nicely fried, thick, skin-on, and lightly salted. Cooked to perfection and not at all greasy. I thoroughly enjoyed my food from Five Guys, and will for sure to be back the next time I have a hankerin' for a good, plain ole hamburger. I sure hope we get one of these in Lake Mary soon--we could sure use a good burger place here! OK, i just found out about this event. But on the last Sunday of the month, there is a Food Truck event in Lake Mary, the Lake Mary Food Truck Crave! It runs from 1-4 PM at Central Park, by the Lake Mary City Hall. Now that I know about this event, you know that I'll be there for the next one, on Sunday, February 26th. Won't you join me? There were so many great sounding menu items at the various food trucks at the Sanford Food Truck Bazaar, organized by The Daily City, that it was hard to decide what to eat, and what to eat next. But when we saw the Jamaican Me Jerk Shrimp at the Bistro Babes Cafe Food Truck, we could not resist--and it was a good choice! And so we ordered and rather quickly received our two skewers, each with three jumbo shrimp. They were very good. The shrimp had been marinated in a bit of a jerk sauce, and were served with a bit of Island-style salsa, pineapple, papaya, onion, and who-knows-what-else. All i know for sure is that it was pretty darned good and a lot of fun--and easy to eat, a must when you gotta eat standing up! Nice job by the Babes! We had a great time at the first Sanford Food Truck Bazaar, organized by The Daily City, last week in downtown Sanford. One of the things we tried was the 5-cheese Mac N Cheese from the 5 Gastronomy Food Truck. It was OK, but just OK, not my favorite thing that I ate. There was no macaroni in it, but instead they used a curly egg noodle, like something you'd find served under some cheap beef stroganoff, or in a soup. Though the sauce was tasty, it was a bit thin and did not stick to the noodles well. I'll certainly give 5gastronomy another chance, as there were other enticing things on their menu, but for a Mac N Cheese, I'd probably go elsewhere next time. Still, because it had some good flavor but only lacked a bit in execution, I'll give them a provisional "thumbs up" vote on Urbanspoon. But as always, I reserve the right to change my mind and challenge you to try their food for yourself and tell me what you think about it. We attended the first at The Daily City Food Truck Bazaar at Sanford last week, and came away impressed--and full! One of the delights we had was the Chicken Tikka Masala Flatbread from the Café Rouge Express Food Truck. All I can say is, wow! I'd had a Chicken Tikka Masala at Cafe Rouge, the restaurant, in the past, and it was awesome, so I had to try their flatbread at their new food truck--I was not disappointed. They were kind enough to divide the huge portion into two for my friend Tommy and I--and the portions were huge, though maybe because I know the chef? But at any rate, this was first class. I was told in the past that they make their own garam masala, and it shows. Anyhow, the food was fantastic, awesome. I'll be back, I'm sure. And if I discover Chicken Tikka on the restaurant menu again, you know where'll I'll be headed! I had a quick bite at the Twisted Cuban Food Truck at The Daily City Food Truck Bazaar at Sanford last week, and came away very impressed. My friend Tommy and I attended and tried a number of dishes at the Food Truchk Bazaar, and one of our top favorites was the Pork Taco at Twisted Cuban. It was awesome. There was a huge amount of tender pork in a soft flour tortilla. It was topped with a delicious and crunchy cabbage slaw and a dressing that had a bit of a tang. My only complaint--or rather suggestion--would be to have a bit less pork and a bit more of the slaw--but both were outstanding. I'll have these again one day, I am sure of it. And, by the way, the picture cannot do justice to these. They were truly outstanding, flavorful, just a hint of spice, tender meat, juicy, and ridiculous! One of my favorite places to eat good Polish food--for lunch or dinner, is Polonia Polish Restaurant in Longwood. And, since my parents were in town to visit, we went there on a recent weekday for lunch. We were not disappointed and had a wonderful lunch. For my lunch I ordered the Polish platter so I'd have a nice sampling of Polish food, and I shareda good 1/4 of it with my Mom. This was a sampling of four traditional Polish foods, all equally wonderful. The sausage was a "white sausage (bialy kielbasa), a sausage that is not smoked. It was fantastic, spicy, fully of flavor, and quite meaty, not overly fatty. The bigos, hunter's stew, was tangy and tender, with bits of meat and mushrooms, truly a delight. The golabek--a cabbage roll--was served with the requested tomato sauge. Ground meat and rice were wrapped in a cabbage leave, then slowly cooked until very tender. The cabbage leave and the tang of the tomato sauce combined to make this dance in the mouth! Yumm. And finally, there were the pieorgi. I've never had a pierogi I didn't love (unless it came from the mega-market's frozen foods section), and these were great as well. I had the potato and cheese, lightly pan fried, served with some caramelized onions. They were wonderful, nice and creamy. I started out my meal with Zurek, a flavorful Polish sour rye soup--also known variously as Easter Soup or White Barszcz--though there are no beets in it. Zurek is make from a sour rye, so it's a tangy soup, It's served with kielbasa and some boiled egg, and also may contain potatoes and carrots. The zurek I had a Polonia was wonderful, about the best I've ever had, both here and in Poland. For their starters, both my folks had the special soup of the day, Navy bean with ham. It was excellent. For his lunch, Dad had a special sandwich, roast beef with mushrooms, onions, and provolone cheese. It was wonderful. Both Mom and Dad had some, and both liked it a lot. As a matter of fact, it was a large sandwich and Dad brought some back to eat at a later time--which he did, and said it was just as good as the first time. My parents were in town visiting and so we took them to Anna's Polish Restaurant recently. It was a smart choice as we had an outstanding meal there. I have been to Anna's a few times in the past, and the food this time was as good or better than any of those previous visits. I'll certainly be back, again and again, to enjoy the wonderful food, atmosphere, and service. We had a reservation and arrived promptly on time at 6:30 PM on a Saturday night. The dining room, which is rather small, was pretty empty, but by the time we'd finished there were people waiting outside for our table, a nice testament to the great food at Anna's. I started out with the Dill Pickle Soup. It was excellent! Basically a beef or chickent stock is thickened and cooked with some potatoes and carrots and cream, and also some dill pickle brine; then near the end of the process, ground dill pickles are added. The soup, though it may sound "odd" to some, is a delight, the tang of the brine and the creaminess of the broth, the crunch of the pickles, the softness of the potatoes--all add to make this a real treat. I loved this and will certainly try to imitate it some time. I was the only one to have the soup, so quickly it was on to our main courses. Both my Mom and my friend Tommy had the Pork Schnitzel. A tender piece of pork loin had been pounded then, then breaded and fred to perfection. For a side, they had the potato pancake accompanied with applesauce and sour cream. Every element of this dish was perfect. The pork was oh so tender and only very lightly seasoned to let the flavor of the pork shine through. I'm not sure how they got it so tender, but it was cooked perfectly. The potato pancakes were not greasy at all, the potatoes were tender and they were very tasty. We all had a bite or two, and all agreed that it was about the best schnitzel ever. I had the meat stuffed pyży, a dish I've had here before. It was truly outstanding. To make it, potatoes are cooked and made into a type of dumpling and then stuffed with a seasoned ground meat mixture. The whole thing is then boiled and served steaming hot with what I think was the world's most flavorful mushroom sauce/gravy. We all had a sample and everyone agreed that they were wonderful. The potato dumpling outside is soft and creamy, the meat inside adds some nice texture and flavor from the seasoning, and the gravy--oh, what can I say, it was awesome, nice and earthy and meaty with mushrooms, silky from the creamy sauce, a true delight! My Dad had the Pierogi Platter. Thankfully we enticed him into getting the large size so we all could have a piergi or two. I am not sure if they make their own, but no matter, they were wonderful, everything a pierogi should be. They were lightly pan-fried and served with some bits of caramelized onion as well as sour cream on the side. I had one of the meat pierogi, and it was fantastic, the meat was lightly seasoned, cooked meat (not ground), and tasted as good as any I've had in Poland (well, perhaps the ones my cousin Alicja made were a tad better, but these were darned close to as good as hers!). We all loved the pierogi. Of course, who doesn't love pierogi, right? Most of our meals also came with side items (besided the aforementioned potato pancakes), and they are worth of comments as well, because they were all so good. I'll list them in order from my most favorite on down, but all were very good. My favorite was a warm cabbage salad that had lots of dill and, I believe, some ground dill pickles in it. It was warm and had a very nice tang to it, perhaps they used some sauerkraut as well. It had a very nice heavy handed dill flavor to it, but the dill did not overpower. It was absolutely delicious. Another tasty side was the Wazanki (Americanized spelling for łazanki, a traditional Polish and Lithuanian dish). It is a very tasty dish made with square pasta, cabbage, onions, mushrooms, and bacon, and sometimes also kielbasa. It was wonderful, a nice compliment to the meal. The pasta brought an element of smooth, the cabbage a bit of tart, the bacon a bit of savory and salty, as well as a bit of smoky flavor. This is another dish I will make one day, it was wonderful. The last side was the Red Cabbage, pictured above behind my pyży.This was a cold salad of red cabbage, nicely cookeb but still a bit crunchy. It was also tender and tangy and quite enjoyable. We could not get away without a few desserts, and so I ordered two, along with 4 forks and plates, so we all could sample them. The first was makowic, a tradtional Polish poppy seed roll. It was awesome, the poppy seed was flavored with honey and finely ground, and the dough itself also was rather sweet. It had a wonderful flavor, I'd buy this by the loaf and eat it all up! The second dessert was something new to me, called pychotka, a walnut torte/cake. This was another "score," just like all of our meal was. There were several layers of whipped cream, a bit of a cake bottom, and a wonderful flavor of walnuts running through the dish. It was a delight in both flavor and texture. I will definitely have to search for the recipe on the Internet, it's worth trying to make myself. Our service through the course of the evenign was great, the food outstanding, and the atmosphere friendly, inviting, and "Polish"--of course. I'd highly recommend Anna's to anyone wanting some fine Polish cuisine--they certainly deliver, and deliver well. Great job! I attended my first Food Truck Bazaar organized by The Daily City recently, and came away very impressed. First off, I am a big fan of downtown Sanford--they host a ton of fun events, and I do mean Fun with a capital "F!" We often hang out in Sanford, usually at our favorite watering hole, The Palette, located inside Art Affair Gallery on First Street in historic downtown Sanford. So when we heard that there was going to be a Food Truck Bazaar nearby, we were all ears. We headed to The Palette to enjoy the happy hour, but then eventually walked the scant block or two away to see what this "food truck bazaar" was all about. I was impressed. About 12-18 food trucks had gathered in a parking lot near the Courthouse building near downtown and there were a ton of people there. The selection was fantastic. Want a cupcake? They got 'em. Want a taco--what kind, many to choose from. Like seafood? Take your pick. Mac 'n Cheese tempting you? The hard part is deciding. The Daily City organizes quite a few "food truck roundups" during the course of the month, and they are generally repeating events, happening every month on the same weekday (first Saturday was Sanford's, but there are more). I will write later about the various places we ate, because we had great food and one helluva lot of fun. We even got to meet the organizer and CE) of The Daily City, Mark Baratelli. Hey Mark, a great event--see you there next month, for sure! Not only did we meet him at the gathering, we ran into him later at The Palette. What a great and fun night that was. I now have the first Saturday of every month on my calendar and you know where I'll be--at The Food Truck Bazaar in downtown Sanford. It was a blast!